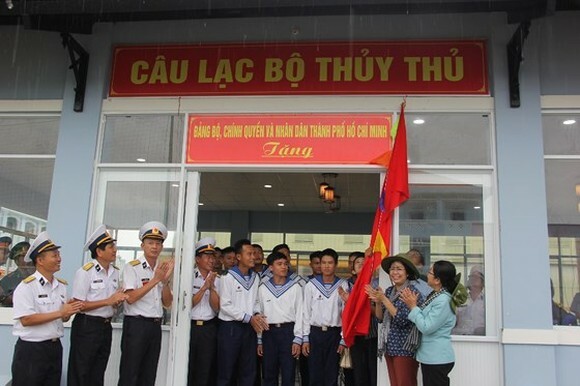 A delegation of Ho Chi Minh City officials led by Vice Secretary of the Ho Chi Minh City Party Committee Vo Thi Dung on August 27 visited the Naval Region 5 Command on Phu Quoc Island of the Mekong Deta province of Kien Giang. The delegation offered incense to late President Ho Chi Minh at Uncle Ho Memorial House and participated in cultural exchanges with soldiers of the Navy Region 5. Ms. Vo Thi Dung offered gifts to soldiers and military officials of the Navy Region 5 to encourage border guard and marine police who are working day and night around islands to protect Vietnam's sea areas and islands . On the same day, the delegation handed over a clubhouse to the Brigade 127 – Navy Region 5. The construction covering on an area of 150 m2 includes a kitchen, a warehouse, entertainment area with a total capital of VND 900 million (US$39,000) which came from the "Fund for Beloved Truong Sa islands" donated by the people of HCM City. Phu Quoc is one of the destinations, including the DK1/ 10 platform and islands of Hon Khoai, Tho Chu, Hon Chuoi, Nam Du and Hon Doc that the city’s delegation was scheduled to visit, starting from August 23.